Mass SMS sending tool delivers job announcements, event details, interview schedules in just simple mouse clicks. BlackBerry group SMS software sends large amount of personal or commercial messages to anywhere in the world. Rich text messaging program efficiently remove all duplicate data entries from your contact lists while sending messages. 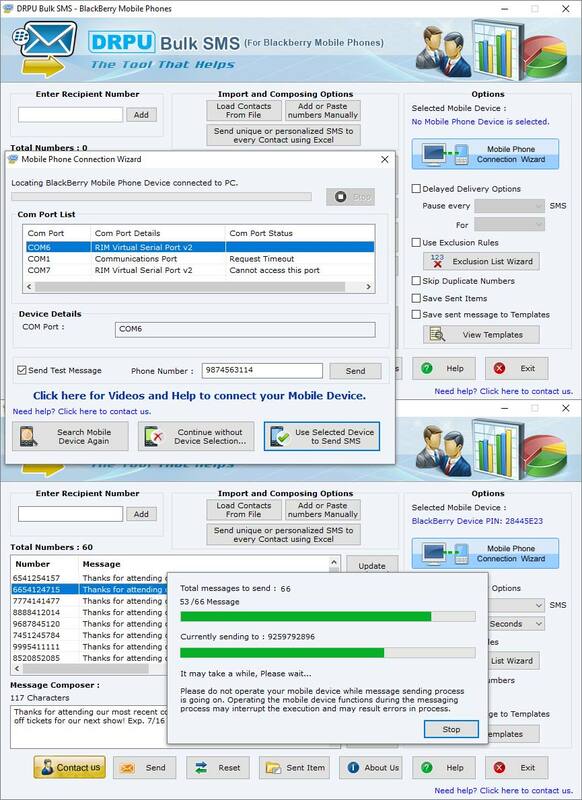 BlackBerry group SMS software easily broadcasts multiple messages to all mobile phone users from your computer system connected with BlackBerry smart devices. Bulk message distribution application facilitates you to save sent messages in system HDD for future references. BlackBerry group SMS software provides instant messaging that helps to get quick response from recipients. SMS marketing utility speedily sends weather reports, poll info, promotional campaigns, event reminders and many more. BlackBerry group SMS software is frequently used in universities, colleges for sending examination schedules, result announcements, important notifications etc to all students. Powerful message sending application has delayed delivery functionality that effectively balances SMS broadcasting load. BlackBerry group SMS software broadcasts massive messages to all national or international network service providers. SMS sending tool provides wonderful GUI that easily accessed by novice users. BlackBerry group SMS software successfully install or uninstall on all available versions of Windows OS. SMS forwarding utility is specifically designed to deliver various messages to all CDMA or GSM based cell phone users. * Bulk messaging tool is capable to skip all duplicate phone numbers from your contact list. * BlackBerry group SMS software easily sends same message to unlimited mobile phone users at a time. * Rich text messaging program broadcasts various message, alerts to boundless contacts globally. * BlackBerry group SMS software permits users to deliver bulk messages without using any internet gateway.